Rendered partly uninhabitable by volcanic eruptions in the late 1990s, the self-governing British overseas territory known as the "Emerald Isle of the Caribbean" is striving to recover and rebuild. Part of the Leeward Islands chain, Montserrat has been plagued by sporadic ash falls and lava flows since 1995 when the Soufriere Hills volcano sprang to life for the first time in centuries. In 1997 a major eruption devastated the southern part of the island and buried the capital, Plymouth. Agricultural land was destroyed, villages were flattened and 19 people were killed. The crisis prompted more than half of the island's population to leave; those who stayed were evacuated to the north. The restless volcano has prevented their return. Britain offered temporary, and later permanent, residence to all Montserratians. Others left for New York, or for other Caribbean islands including Antigua. Montserratians living in the US have had their "temporary protected status" revoked; many may have to leave. With volcanic activity in their homeland unlikely to cease, the US Department of Homeland Security no longer considered their situation to be temporary. Tourism was once the lifeblood of the economy. However the destruction of the capital and the closure of the island's airport halted much economic activity. Montserrat has relied heavily upon British and EU aid to rebuild; a new airport was inaugurated in 2005. Named by the voyager Christopher Columbus in 1493, the island became an English colony in 1632. Most Montserratians are of African descent. The Montserrat Oriole, galliwasps (lizards), and mountain chickens - edible frogs found in the highlands - are among the island's notable or endangered species. The island's public radio station, Radio Montserrat, broadcasts a full-service format of news, volcanic activity reports, music and entertainment. The station broadcasts on FM; it lost its mediumwave (AM) transmitter to volcanic activity in the late 1990s. There is a weekly newspaper and a cable TV provider. 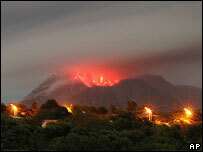 Montserrat volcano: Has it gone quiet?